The cliché about ingredients being the key to good Italian cooking is, like most clichés, partly true. Contemporary Italian has few hiding places (it’s been several hundred years since dishes there were last smothered with spices). When I cook I always try to buy the best I can afford. I need to work with quality. But when I’m eating Italian food out, it’s hard to know in advance what I’ll be getting and if it will be worth it. 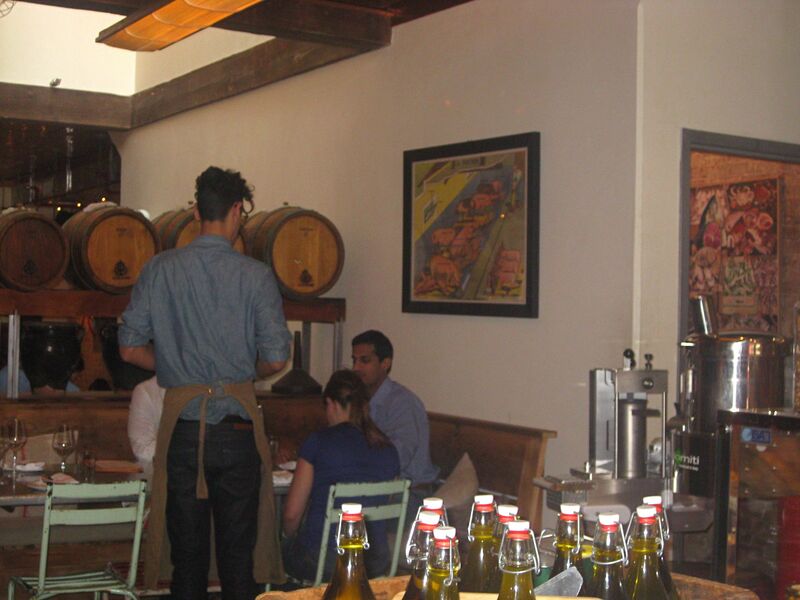 At Il Buco Alimentari e Vineria it’s worth it, whether you buy there or eat there. The point of the pretty little place, which is part restaurant and part food shop, is the high quality of its ingredients. Many products are made on premises. The house-made salumi and breads are the best I’ve had in New York. Seriously. The space is chic and somewhat trendy looking, but it’s got the feel of many of the food stores I’ve been to in Italian cities, places where shopping and eating are intimately mingled. Il Buco is the anti-Eatly approach to Italian food, a place to purchase excellent salumi, breads, cheeses, olive oil, dried beans, sea salt, and pasta, among other things, without getting pushed around by celeb-chef-crazed tourists. But it’s also a place, thanks to its chef, Justin Smillie, to sit down and eat simple but creatively prepared dishes made from those lovely ingredients, morning, noon, and night. When I walked in for lunch the other day I noticed the air actually smelled of bread. In Manhattan this isn’t common even in bakeries (why, I wonder—food should be seen and not smelled?). The bread is intensely flavored, primarily, I discovered, because of the very slow fermentation of the dough with wild yeast. This is the patient work of Kamel Saci, Il Buco’s master baker. You get a basket of sliced breads when you sit at a table, or you can buy a loaf to go. After taking in the baking fumes, I knew that for lunch I wanted a panini, so that’s what my friend and I ordered. I chose porchetta, which they make with pork from local East Coast farms. My friend had a brandade panini, fashioned from house-cured salt cod (wow, that’s kind of special—who bothers to preserve their own cod?). The brandade sandwich also included roasted red peppers and arugula and was finished with really good olive oil. The bread on both sandwiches wasn’t grilled or pressed but just left as is, crusty on the outside and slightly soft within, so it soaked up all the juices from the cod and the tender herby pork very nicely, just what I always crave in a sandwich but seldom get, a melding of bread and filling so the sum is greater than the parts. The panini were highly flavored, and the chef understood that a side of giardiniera, that vinegar-cured Southern Italian vegetable medley, was the perfect accompaniment. That day the giardiniera was a mix of cipollini, baby parsnips, and cauliflower. And it wasn’t mouth-puckering sharp like the stuff my family used to buy in jars from Progresso (or the jars my uncle Tony used to put up in his garage—boy was that ever rugged). It provided a fabulous tingle that lifted the fragrant oils on my palate just when they needed lifting. I came back a few days later just to do some shopping. I had been thinking about the house-cured lardo I’d seen on the takeout counter on my first visit and wanted to get my hands on some, and maybe some culatello too. They cure and age all their pork products in the basement, with state-of-the-art knowhow. Pancetta, capocollo, finocchiona, and guanciale are other options, either to buy or to fashion into your own custom-made plate to eat there. These amazing salumi, the work of butcher Bernardo Flores and longtime salumi maker Christopher Lee, have the aroma and texture of some of the best stuff I’ve sampled in Puglia and Umbria, smooth, warm, no sharp edges. While browsing the takeout area I noticed they also carried Fra Mani cured meats, a great artisanal product made by Paul Bertolli, former chef at Chez Panisse and Olivera. His excellent salumi has been hard to find in New York since the 14th Street Balducci’s folded. It was nice to see again. They sell and cook with Gentile pasta, a company from Gragnano, near Naples, that’s been in business more than 100 years and makes dried pasta the right way, with high quality durum wheat, old-fashioned bronze dies, and a slow, natural drying process to heighten flavor. Also it’s packaged in lovely deep blue and gold bags, which I find glamorous. I bought rigatoni and gemelli to take home. After shopping I was really hungry, so I ordered a glass of prosecco and a plate of spaghetti with bottarga di muggine, the salted, press mullet roe that’s a specialty of Sardinia. For me, good durum pasta with a salty fishy sauce is about as good as pasta gets, and this was sensational. Again, it’s all about the ingredients, and this dish contained three: great pasta, great olive oil, and great bottarga. They also make a bucatini alla gricia with their own guanciale. I’ll be going back for that. Oh and I almost forgot to mention their home-made ricotta, which I also sampled on this visit. Aside from my own, it’s the best I’ve had in this fine, Italian food obsessed city (I wonder if they make it with buttermilk like I do?). I haven’t yet been for dinner. I hear it gets a little hectic, and in any case I really see Il Buco as more of a lunch and shopping spot. The noise level at lunch, even though the place was completely packed, was not overly loud. I do, however, have one big gripe. The wines by the glass are over-priced across the board. I’m not sure what they think they’re doing with that. Many places in town are now lowering their glass prices, which got completely out of hand about eight years ago during the wine bar boom. I’d knock a dollar off each glass. Note: Il Buco Alimentari & Vineria has a sister place called Il Buco, a real restaurant, on Bond Street. It’s a wonderful, more formal place that’s been in business for many years. Just so you don’t get them confused. Set up a medium pot of water, and bring it to a boil. Add a little salt, and drop in the escarole, blanching it for about a minute. Pull it from the water, and put it in an ice bath to cool. Drain the escarole, and squeeze as much water out of it as possible. Then give it an extra few chops. In a sauté pan, heat about 2 tablespoons of olive oil over medium high heat. Add the escarole, garlic, lemon zest, and fennel seeds. Season with salt and black pepper, and sauté until the escarole is tender and well infused with flavor, about 2 minutes. Grill the bread slices on both sides, and then brush them lightly with olive oil on one side. Lay the lardo slices on the oil-brushed side of the toasts. Then divide the escarole up on top of the lardo. Serve hot. This is best eaten with a knife and fork. I love Il Buco. I have become completely addicted to their sandwiches! Great recipe. I have just bought their breads to take home, but now I am encouraged to bring some salumi home as well. Yes. Their panini have a gloriously soaked quality. You should write a food column….become a restaurant reviewer; get free meals. You got the flair for it. Reading your blog/column makes me regret all the cooking i DIDN’T DO…the passion I didn’t have for the work because, back then, it was simply a mindless grind…for me, anyway. Love your writing more and more; keep it up! Thanks MIchael. I’d love a food column ( I mean one I could even get paid for). They’re hard to come by, but that is one of my goals. I’d like a steady gig at the New York Times. up. Grrrr… well I’m not writing all that over again.